This year, for the first time, we started the "Elf on the Shelf" tradition. We had so much fun with it! 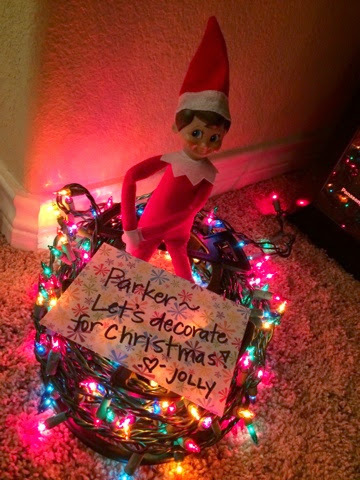 Our elf, who Parker named "Jolly", arrived the day after Thanksgiving and left Christmas night. I know everyone has their opinions about "Santa" and "Elves" and what to have your children believe. I don't want to go into all of that here and now because I'm all for each family doing what's best and right for them. I also say that we have talked to Parker a lot about Jesus. He will tell you that "Jesus' birthday is on Christmas" and he knows that Jesus' Mommy and Daddy are Mary and Joseph. He also knows how many kings brought gifts and that Jesus later died on a cross. 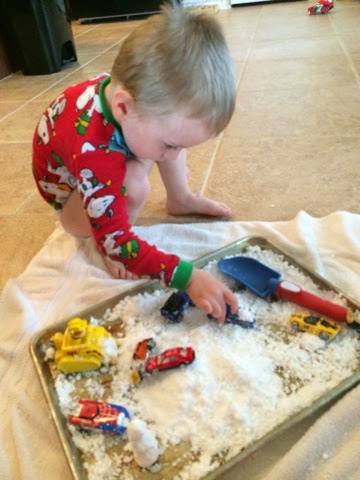 We are keeping Christ in Christmas, but having childlike fun as well. It's the most wonderful time of year, but it's also the busiest time of year - all in good fun though. Obviously I have been absent from the blogging world since Halloween. The months of November and December have been non-stop with various things going on here, there and everywhere...and this dearest blog of mine has been put on the back burner. I fully intend to share about the wonderful Thanksgiving that we had, but I still need to sort through all of the pictures to pick a few favorites. We stayed home for Thanksgiving as our family of three - we enjoyed a yummy feast and decorated for Christmas over the weekend. 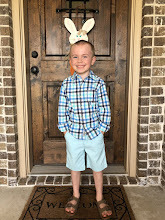 I love that this blog documents our life so I will post our Thanksgiving pictures as soon as I am able to - hopefully before next Thanksgiving! In the meantime, life has been full to the brim, but we are having lots of fun and trying to enjoy all of the wonderful things that the Christmas season brings.